PT Krakatau Bandar Samudera - KBS or later known as Cigading Port is a reputable company in Indonesia, running business in port management service. PT Krakatau Bandar Samudera operates primarily as a port operator of Cigading Special Port in Sunda Strait Cilegon Banten Province. 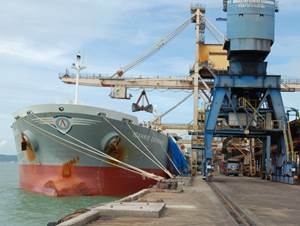 At present, Cigading Port was able to handling up to 12 million tons of cargo and will be expand to handle up 20-30 million tons. PT Krakatau Bandar Samudera is a directly-owned subsidiary company of state-owned steel makers by PT Krakatau Steel (Persero) Tbk (Krakatau Steel Group). PT Krakatau Bandar Samudera was established as a separate legal entity in 1996 as a spin-off results of Cigading Port, the autonomous supporting units of Krakatau Steel Group. In term of financial performance, PT Krakatau Bandar Samudera recorded a satisfactory performance growth in 2017. According to information found in PT Krakatau Steel (Persero) Tbk Annual Report 2017 as cited by JobsCDC.com, PT Krakatau Bandar Samudera registered total revenue of USD 68,675,000 in 2017. This number is an 5.54% increase from USD 65,068,000 in 2016. Total profit in the position of the end of 2017 showed an increase of 49.01% from USD 13,511,000 to USD 20,133,000 in 2017. JobsCDC.com now available on android device. Download now on Google Play here. Please be aware of recruitment fraud. The entire stage of this selection process is free of charge. PT Krakatau Bandar Samudera - Management Trainee Program Krakatau Steel Group December 2018 will never ask for fees or upfront payments for any purposes during the recruitment process such as transportation and accommodation.